It's finally the weekend!!!! I don't know about you, but for some weird reason I feel like I appreciate weekends more now than when I was still in school - weird. Anyway, time for more anime! And this will be my last post as part of the 30 Day Anime Challenge created by A Geeky Gal. I'm a little sad to see this challenge come to a close, but that doesn't mean I'm going to stop watching anime anytime soon! Just today my boyfriend told me about an anime series centred around swimming, think it's called Free!, so I'll be giving that a try sometime this weekend for sure. All of them! Or at least most of them! Seriously, the majority of the anime series I have fallen in love with over the years have been based on a manga series, and they only create 1 single season for it and change up the anime's ending to kinda-sorta wrap things up. It's the worst! Like for Ouran, I collected the entire manga series in order to continue on with the characters and see what they would be getting up to, and I wish so badly that those types of anime series would cover the entirety of the story line - or even to create a whole new story line, sort of like what they did with Fullmetal Alchemist where yes, the first anime is nothing like the manga series but it's still it's own thing, which is cool in its own right, and then there's Fullmetal Alchemist Brotherhood for people who want to see the series leap from the manga to the screen. And don't even get me started on the anime for La Corda d'Oro - that anime, while amazing, was basically created for the sole purpose of selling the La Corda video games/dating sims. And yes, the series also continued as a manga series, but then they put out La Corda d'Oro: Secondo Passo which you would think would be a whole new second season, WRONG - it's 1 or 2 episodes to advertise the new series of games, and to introduce the new characters/love interests the game throws into the mix, and that's it! I know from scrolling on Crunchy Roll that there's a new La Corda series out there with entirely new characters, but as I haven't watched that series yet or done any real research on it I won't comment whether that anime was created for a similar purpose. Well I've already mentioned anime series that have made me sad, so I'll leave sadness and other negative emotions out of the equation for this question. As for other types of emotional impacts... Okay: Recently while scrolling through Crunchy Roll, I saw that both Gundam SEED and Gundam SEED Destiny were available to watch. And as much as I love that series, because it was the first real anime I ever got into, I feel like watching it again would be such an emotional roller coaster. Not just because of nostalgia, but it's a dramatic series, and over the course of 48 episodes, a lot happens! So freaking much happens! I also feel like I've felt quite connected to InuYasha in that was as well - on YTV when I was 13, either before or after Gundam SEED would come on, I would see an episode of InuYasha airing. And eventually I watched more of the series and learned more about the overall story, and I even watched all four of the films (Note: I have not yet watched InuYasha: The Final Act, so PLEASE no spoilers in the comments). The first film I ever watched was the second one, which featured a pretty awesome kiss between InuYasha and Kagome, and even though I didn't know the characters that well when I first saw that movie, it struck a chord somewhere in me. I might not typically seek out fantasy anime series, but InuYasha is always the 1 exception. That would most likely be Ouran - that's a good anime to throw on any time, and I even remember one Christmas season when I was working on making gifts in the garage, I was watching Ouran in the background for entertainment, and typically I don't see watching anime as an activity with which you can multi-task. 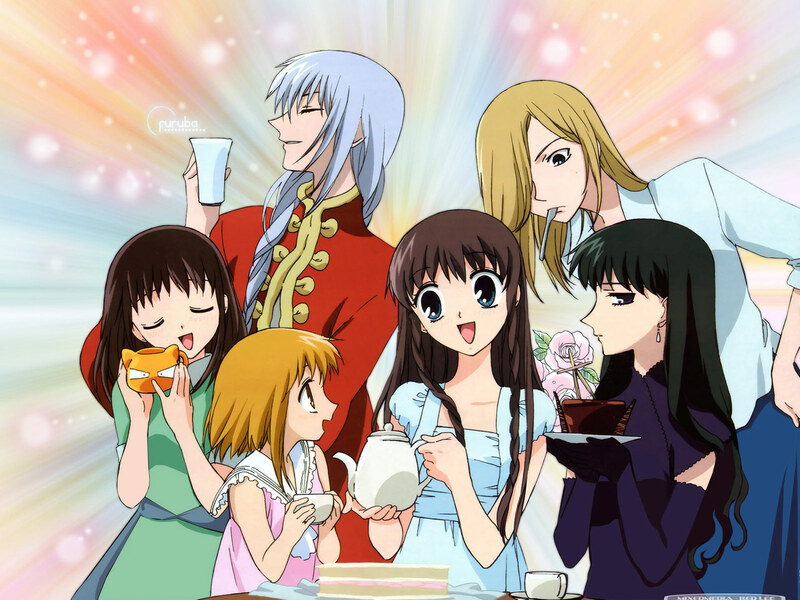 And there's also Fruits Basket, which puts me in a better mood and makes me smile whenever I re-watch it 💟 I have also been known to put on The Wallflower when I need a pick-me-up and something to make me laugh. Day 26 – Who is your favourite anime villain? Ugh, hard question..... While it has been a very long time since I watched this series, I think I might have to go with Fley from Gundam SEED. Yes, she was more of a love interest character, but she also had really bad intentions for seducing Kira in the first place and I sort of loved to hate her. Of course when she dies it breaks Kira's heart, and she sort of redeems herself after the fact, being relieved from her the hatred that was burdening her and guiding her actions. I know that I try to be like Tohru Honda from Fruits Basket - I idolise her optimism and her overall sunny personality and positive outlook. 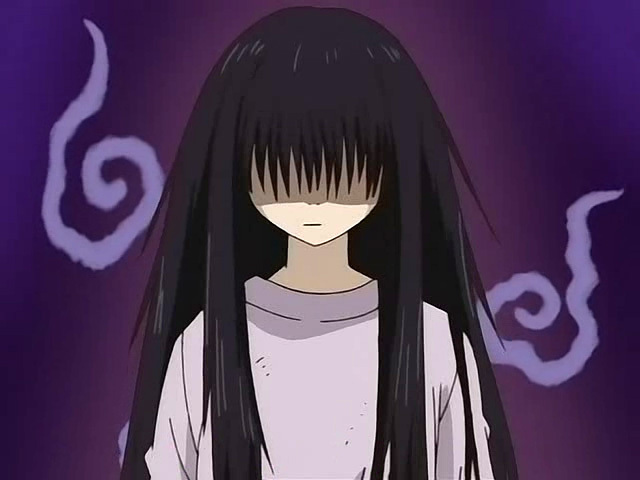 Though in reality I'm probably more like Sunako from The Wallflower - tangled mess of hair, living in sweat pants, hiding in my room in the dark in front of the TV. Plus I'm always at least a little bit weird 😛 I'm certainly not any kind of horror fan, which is Sunako's favourite thing in the world, so that's where the similarities end. Easiest question of the lot - it's called Parasyte. My boyfriend and I watched a screening of some of the first episodes when we were at Anime North one year - the main character has this eyeball and a mouth growing out of his hand, and the whole thing is just super gross and creepy and I couldn't watch much of it before I had to leave the room. Kurt seems to get a laugh out of me cringing over that series, even to this day. Possibly One Punch Man? But I'm not entirely sure if I was dreading watching that series or not. I know when Kurt and I first started dating that he loved the series, and he really wanted to show it to me and get me into it, and I was probably hesitant because I usually am with watching new things, especially boy-centred new things (I'm ashamed to admit this now, but Kurt had to basically drag me into watching the original Star Wars movies for the first time). But I do absolutely love OPM, because it's hilarious and quirky and super weird and I'm really looking forward to watching the second season. I really did have a blast getting re-acquainted with anime over the past 30 days. If you guys really enjoyed the anime-type content, let me know in the description below and I'll see what I can do about writing posts about anime more often. Until next time, I'll keep you posted!